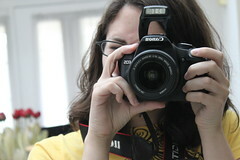 When I got home from tour, I decided to get the Canon Rebel T1i I'd been eyeing for a little while. I love how great the photos look, even though I've only figured out the autofocus modes so far. Luckily, I have some downtime at home for the rest of the summer so I can learn how to do everything else on this camera. Maybe I'll even post an HD video recorded with this guy soon. I'm pretty excited about it! those cameras look amazing. good luck figuring everything out! $829 on sale with the lens kit.